A beautiful and secluded completely solar powered cedar cottage located in the heart of the rainforest. At 1500 feet, high above the rift zone and over ten miles away from the active lava rivers, this private little getaway is a safe and relaxing place to appreciate the Big Island of Hawaii. 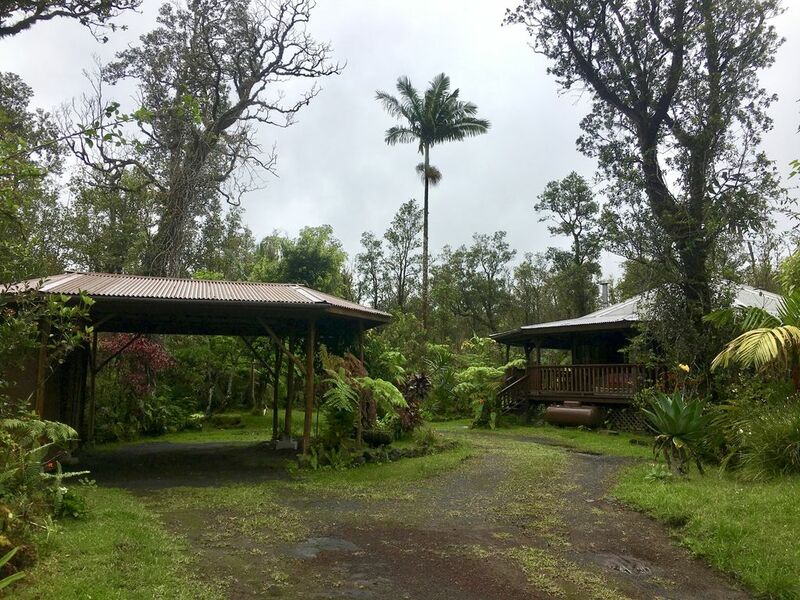 The cottage has a large lanai that wraps all the way around, giving you a 360 degree view of the spectacular native trees and giant ferns, fruit trees and exotic flowering plants. This cottage was built with the earth's future in mind. It is completely solar supported along with the natural mist of the rainforest supplying water for all but drinking. There is ample purified water for your enjoyment. The cottage has 1600 sf of indoor/outdoor living space. Guests can sleep in the queen size bed as well as on the large comfortable sectional sofa. Some guests may enjoy sleeping outdoors in the hammock on the covered lanai. Explore the surrounding acre of tropical forest or relax from one of the hammocks on the lanai listening to the birdsongs during the day. At night, be lulled to sleep by the peaceful sounds of tree frogs and the moonlight shining softly through the large 6' skylight above you. A hot bath on the lanai or a refreshing outdoor shower is the perfect way to start your morning. A short drive away, you will find waterfalls, beaches, and caves, as well as wonderful roadside fruit stands, farmers markets and shopping. Everything the Big Island has to offer is right at your fingertips. Once you experience all that the Big Island has to offer, you don't ever want to leave! That's how we felt when we visited for our 20th wedding anniversary. From the stark beauty of the lava fields to the bright blue water lapping against black sand beaches and the cool peaceful tranquility of the rain forests with their soaring palms and giant ferns, Hawaii is a magical place. This charming round house hidden away amid the trees is everything that Hawaii means to us. The wrap around lanai, six foot sky light, and outdoor bathroom and shower make this home unique. From any point inside or outside of the home, you can feel the spirit of aloha. All your standard bathroom needs accommodated in the privacy and glory of nature's beauty. Full Kitchen with dinnerware, silverware, pots and pans. Kitchen table and kitchen bar for seating. Breakfast Bar with two bar stools. Indoor Table with two chairs. Outdoor Table with two chairs. Prepare yourself a hot bath. Relax to the tranquil sights, sounds and splendor of nature in the private outdoor deep clawfoot bathtub. Nice, private, great gardens, lovely kitchen and fun outdoor bathroom. Very fun place to stay. Tropical paradise, fantastic rainforest setting. I loved everything about this magical place. Beautiful tropical plants surrounding a beautiful cottage in the rain forest. Sleeping with all the rain forest sounds was amazing and the beautiful skylight lets you star gaze from bed. I hope to spend many more days and nights in this wonderful place, it's a tropical vacation away from all the city lights and stress.